The basic premise of an elemental diet is providing nutrition in an easily absorbable form, including all macronutrients: carbohydrates, fats, and protein. Because these macronutrients are broken down into their end components, further breakdown is not necessary for digestion, allowing the gut to rest. When evaluating if a hypoallergenic elemental diet free of common allergens would be an appropriate choice, questions can arise for both practitioners and patients alike. Is a full elemental diet necessary? A full elemental diet is the evidence-based protocol intended to provide dietary management under medical supervision for adult patients with moderate to severe gastrointestinal dysfunction.1,2,3,4,5 During a full protocol, the elemental diet is the only nutrition the patient is receiving or consuming for a period of 2-4 weeks in duration; no other foods are consumed during these weeks. Duration and intake can be easily customized to fit individual patients’ needs. It is popular among practitioners to recommend a full elemental diet from anywhere between 3 to 5 days up to 4 weeks for acute support or extended gut rest, respectively. A half elemental diet is one in which half of the patient’s caloric needs are met with an elemental diet while the remaining are met with tolerated whole foods. This is often used for patients who are unable to, or unwilling to, tolerate a full elemental diet. Half-elemental diets can be used to initiate a full elemental diet or to transition out of a full elemental diet. A half elemental diet can also be supportive for those who have a small list of tolerated foods and need secondary nutrition sources. When doing either a full or half elemental diet, daily caloric needs should be calculated prior to starting. Once calculated, a total number of daily servings should be targeted. Insufficient calories during an all-liquid diet yields insufficient nutritional support for the patient. Practitioners report leaning toward the high end of a caloric range in order to ensure satiety and energy. Is an elemental diet appropriate for patients with Proximal SIBO or a fungal propensity? One of the advantages of an elemental diet is that carbohydrates, proteins, and fats are in their assimilated form: partially hydrolyzed carbohydrates, free-form amino acids, and medium chain triglycerides. This takes strain off the processes that are normally required to provide this function. When evaluating the type of carbohydrates used in formulas, dextrose is a common carbohydrate source within an elemental diet. Dextrose is absorbed in the proximal small intestine prior to it reaching the distal small intestine, where commensal bacterial overgrowth is common. For the dietary management of patients with small intestinal bacterial overgrowth (SIBO), this is ideal, as it minimizes overgrowth. An elemental diet has been shown to be supportive in normalizing lactulose breath test after being used for a period of 14-21 days. With fungal propensity, interventions can be implemented leading up to and during an elemental diet. In theory, if the microbial overgrowth is proximal, care must be taken to consume the medical food slowly, use smaller amounts at a time, and consider supportive agents to minimize overgrowth. If patients become bored with repeated flavor or are looking to deviate from their diet, it is important for them to speak with you as their healthcare professional before altering their plan of action. Encourage patients to maintain an active and healthy social life while exploring activities that don’t involve food (think mini-golf, pottery, and more). Inviting them to lean on friends and family for support and to remain positive are key to adherence. Add ice in a blender along with the formula for a smoothie-like experience. Make up a pitcher of the medical food and store in the fridge for a cool and convenient drink. Consider consuming with additional water to adjust to taste. For those on-the-go, mix the powder in a mason jar or favorite beverage carrier to make the product more portable. Bures J, Cyrany J, Kohoutova D, et al. Small intestinal bacterial overgrowth syndrome. World J Gastroenterol. 2010 Jun 28;16(24):2978-90. Devlin J, David TJ, Stanton RH. Elemental diet for refractory atopic eczema. Arch Dis Child. 1991 Jan;66(1):93-9. Ueno F, Matsui T, Matsumoto T, et al. Evidence-based clinical practice guidelines for Crohn's disease, integrated with formal consensus of experts in Japan. J Gastroenterol. 2013 Jan;48(1):31-72. Van Citters GW, Lin HC. Management of small intestinal bacterial overgrowth. Curr Gastroenterol Rep. 2005 Aug;7(4):317-20. O'Moráin C, Segal AW, Levi AJ. Elemental diet as primary treatment of acute Crohn's disease: a controlled trial. Br Med J (Clin Res Ed). 1984 Jun 23;288(6434):1859-62. Pimentel M, Constantino T, Kong Y, et al. 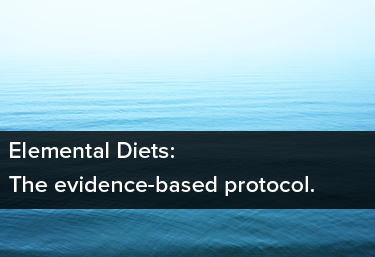 A 14-day elemental diet is highly effective in normalizing the lactulose breath test. Dig Dis Sci. 2004 Jan;49(1):73-7.